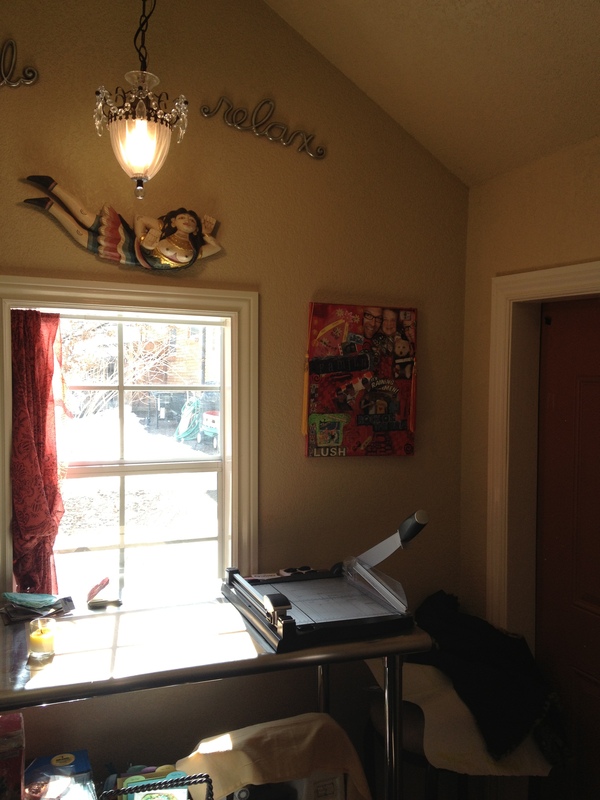 My little solar-powered art shack is cozy and warm inside but outside it is another story. 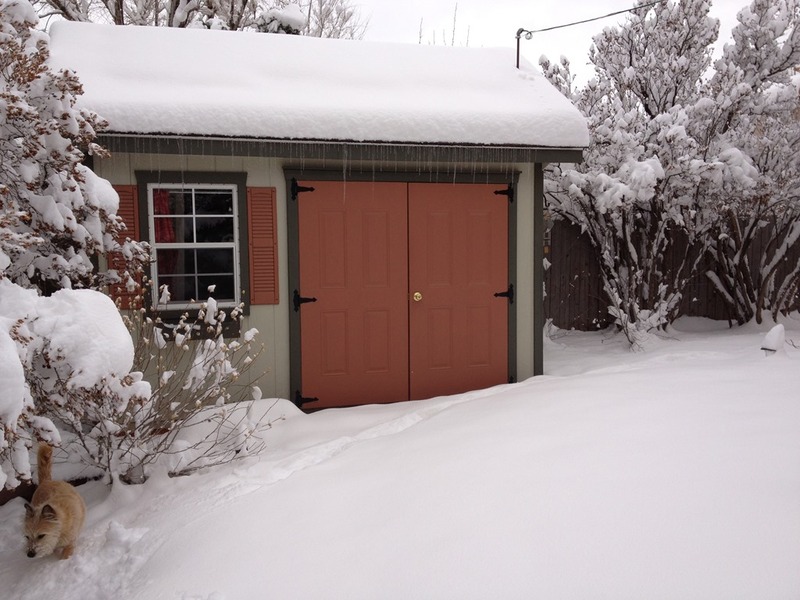 We got about 14 inches of snow (in one day) last week in our area. My art mascot, Sophie (lower left), loved the trek out to the art shack and she spent considerable time tossing snow into the air with her snout and generally tearing around like a mad dog. This is the rain chain my husband put up a week ago when it was in the high 60s and low 70s. As it turned out it was a bit premature to put up the chain and the rain barrel but it did form the most awesome ice formation. I love nature’s art! This is me dancing in the snow! 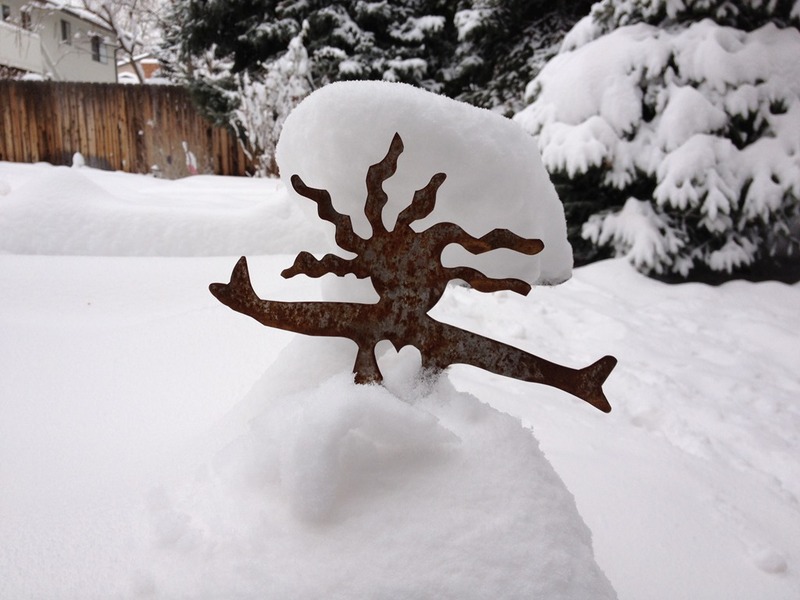 I love the way the snow formed a “hat” on my hair and filled my heart with fluffy beauty! I’ve been trying to learn how to add video to my blog so let’s see if I’ve figured it out…. For the past few days I have been stretching the boundaries of my comfort zone and trying some new things. Specifically, I have been making short videos for YouTube. A few months ago I started watching tutorial how-to videos on YouTube. I started with videos made by the design team at Swirlydoos.com. I love their style and their monthly scrapbook kits and their videos. Well if you’ve ever been on YouTube you know that once you watch one video on YouTube they suggest about a bazillion more that you might like. I happened upon some made by a woman named Shannon Green of Houston, Texas. Some of her videos are tutorials about various artsy projects but a great many of them are show and tells about her shopping hauls and her art projects and things she gets in the mail. I just love them. She has a great sense of humor and loads of creativity. If you put her name in YouTube you will find her videos. Another of my favs is StudioJanine–she is an artist in Germany and does some very cool and fun art journaling videos. She does some videos where she talks and some that are watching her do art journal pages with a peppy musical soundtrack. I enjoy both kinds. Back to the point of this post–I was recently sick for a week and in between coughing fits I watched A LOT of YouTube video tutorials. I thought to myself–I can do this. I have things to say and things to show and I love telling people what to do. I’m going to make a video about something and put it on YouTube. So I took my husband’s Flip video camera and my iphone and my digital camera that also has video capabilities out to my art shack. I had a mini tripod I got somewhere so I put the Flip video on it. Good. In all the videos I watched I saw a few basic angles used by the video tutorialists–mostly shooting from overhead and looking down or shooting from the side and sort of above. I had no idea how I would get my camera overhead so I went for the side shot. I quickly realized that I did not have the area to put my camera to the side and get it far enough away to view the right spot. hmmm… I made an executive decision to shoot from the front and at a downward angle so only my hands would be on camera. I balanced my little tripod on my paintbrush holder and held it from toppling forward with a crystal dish full of bits and bobs. Oh yeah I’m almost ready to roll! I decided to do a show and tell about a recent project. Okay good. When I went to power on the video camera it dislodged from the paintbrush holder and it toppled forward onto my project. No biggie–set it up again. Start again. I quickly realized I had no way to see if the camera was set up and if my project was in the frame because the screen was facing away from me. Even by standing up and trying to look around the back it was an impossibility–my eyes could not bend that way. Well hell. Oh what the heck–just film some and then check it. Okey dokey. Lights, camera, action. Lights??? How about light. Light as in one light. My clip-on lamp. Oh whatever–I’m sure it’ll be fine. So I proceeded to stumble and fumble and stammer my way through telling about my project for a few minutes. When I viewed the playback gaaaa– I realized that my camera angle setup was waaaaay off. Only about a third of my project was visible in the frame. The audio was clear and a good volume so my halting and stumbling description was clear as a bell. Drat. My light–well who would’ve ever dreamed that one light bulb could create such a blinding glare on only one side of my surface? Back to the drawing board. I decided to use my digital camera which also has video capabilities. Got the behemoth on the mini tripod. Got it balanced on my paintbrush holder, yada yada yada…action! Played with the light a bit. Turned on all the other lights in the room and shut off the lamp–nope that doesn’t work at all. Put down a white sheet of paper under my project piece–that seemed to help. Placed my project into the filming area differently so it should be in the frame. Alrighty then. Well, I didn’t stumble quite as bad during my show and tell spiel. It helped that I had just been through it five minutes before. When I did the playback I wasn’t quite as mortified as the first time. The lighting was better up to the point that I forgot what the white paper was for and moved it out of the way. My project was mostly in the frame. Take 3. I decided to try my iphone but it doesn’t have the little screwy thing so it can’t go on the mini tripod. That’s okay because I am now pro at using my paintbrush holder and other crap on my desk to balance stuff. Okay–maybe not–because my iphone will not stay put. Or maybe it’s trying to off itself to avoid being part of this video debacle. Okay–change in plans. 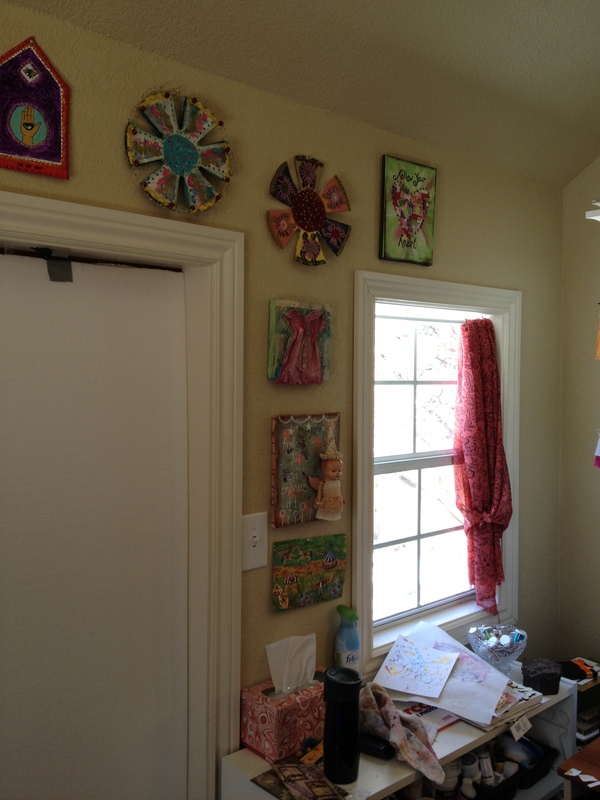 I decided to do a handheld video tour of my 8’x12′ art shack. 29 minutes. This was probably way more thorough than would be interesting to anyone including me. I never knew there was so much to talk about in that small space but talk I did! I documented every bit of everything. It was good practice. I have a whole new appreciation for anyone who has anything to do with making videos. I can’t believe I was so naive as to think all you had to do was click a button and whammo you have a quality video. A couple of days later I ordered a Sony Bloggie HD video camera. I’ve done three videos for YouTube. They are far from perfect but I’m learning more with every one of them. I figure if I wait until they are professional quality I will never post anything. If you would like to view my film masterpieces on YouTube just go there and put Katyoparty in the search box. Til next time….be brave and Art Out With Your HeArt Out! On your left when you walk in the door. Art made by me and others. 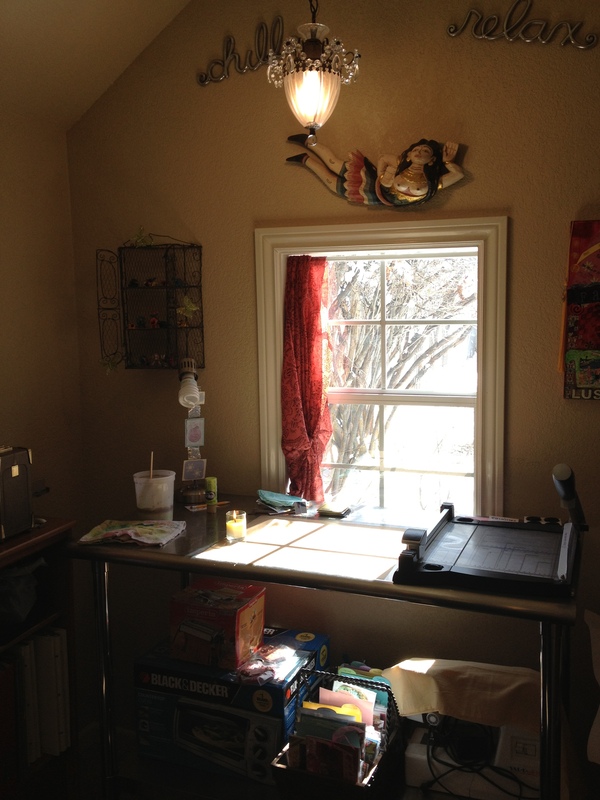 A work surface with craft mat and paper cutter. Storage on the bottom shelf. This table is on wheels so it can be moved easily. 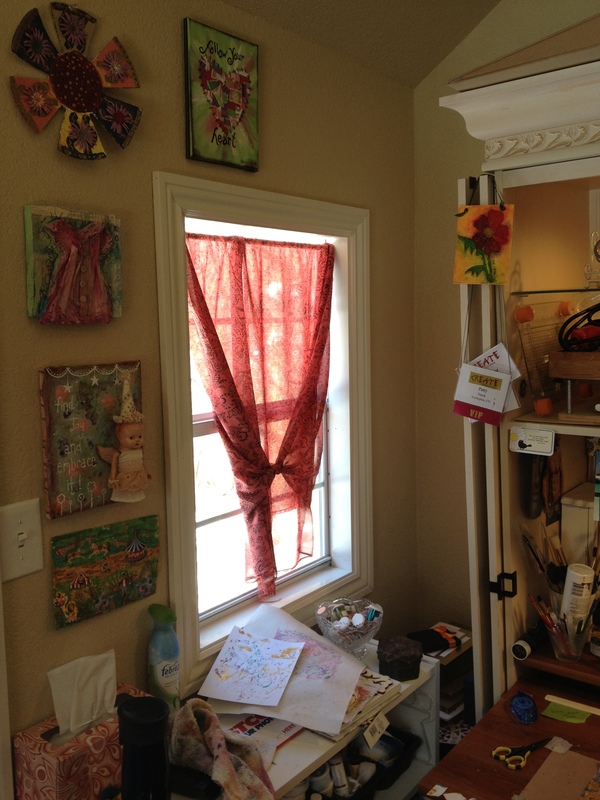 When I sit and work at the armoire’s pull-out desk I can see my garden and the path leading to my art shack. 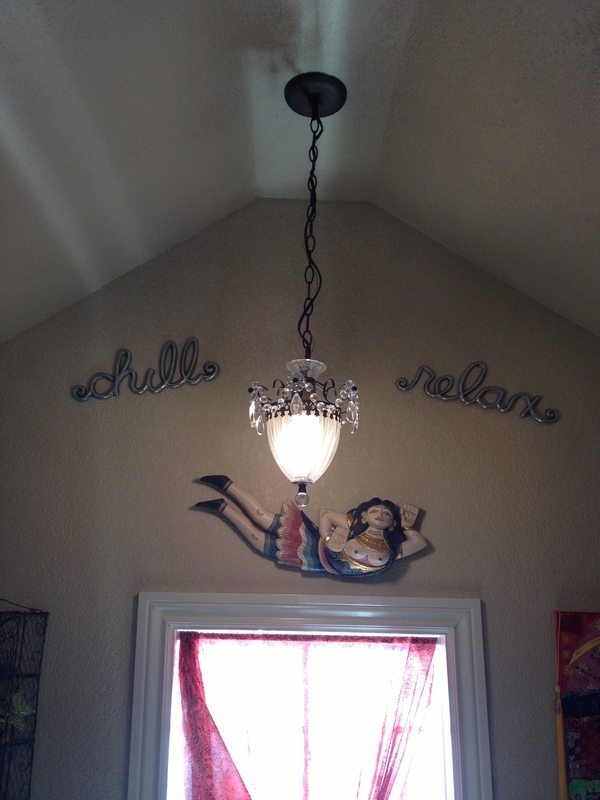 I love my small chandelier and my floating lady and my wall sentiments. These storage carts are on my right when I sit at the armoire pull-out desk. All are on wheels for easy movement. Most of the time I sit at the armoire and work at the pull-out desk. Everything is within arms reach. I have my stereo up top and I have a remote control for it so I don’t even have to get up to use it. This is my armoire. There is a pull-out desk on the left. This thing has LOADS of storage. 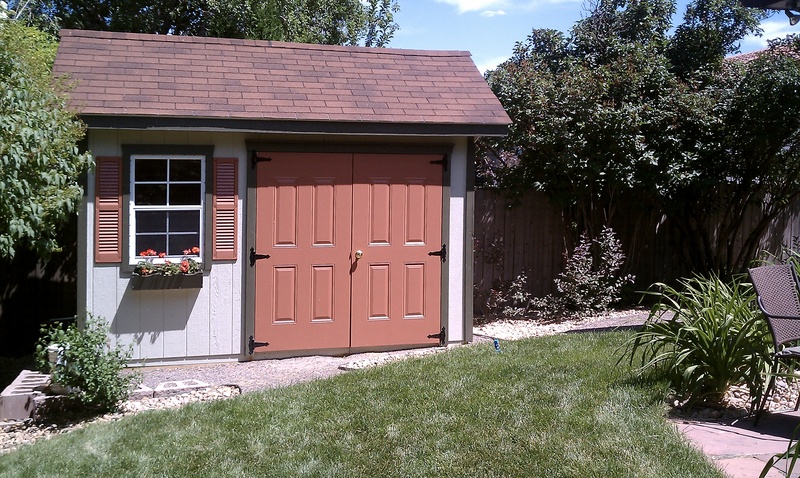 When the doors are shut it looks very nice but I leave them open all the time. 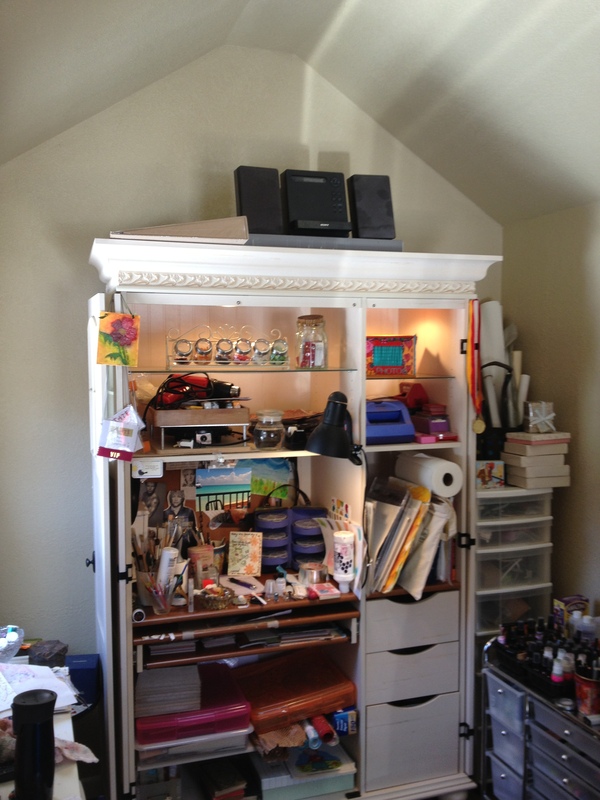 Another storage option that has my Vagabond die cutting machine on top. It is on wheels for easy movement. 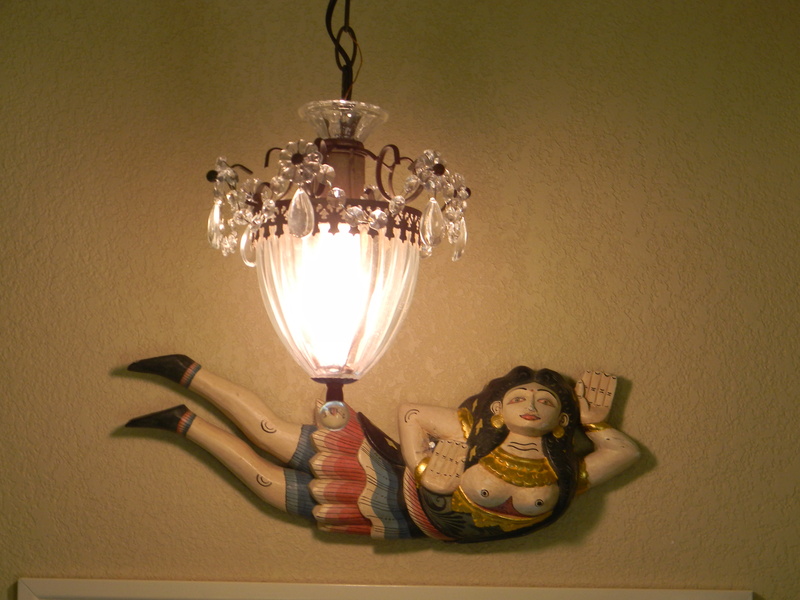 A closeup of my pretty chandelier and my booby floating lady! 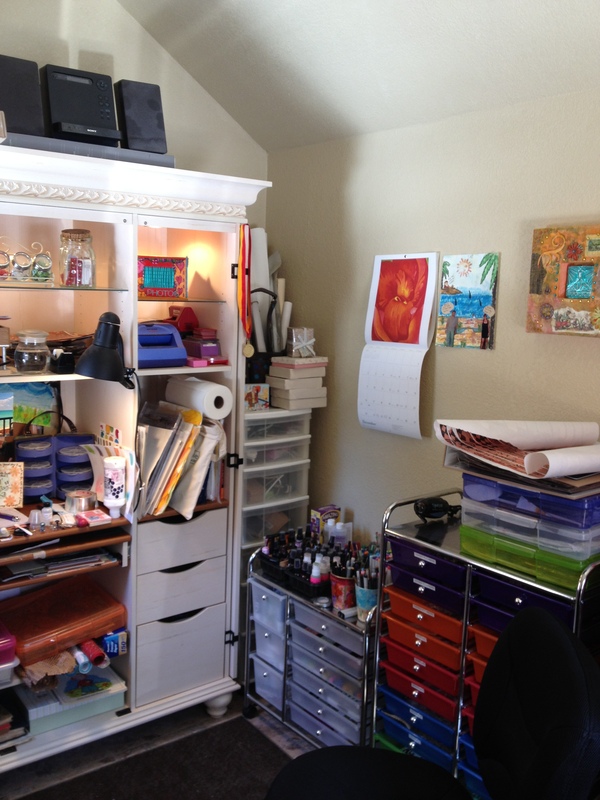 This is my creative space. My place of serenity and calm. In here I am surrounded by happy things. There is nothing in this space that I don’t love. I have art from other artists that I find inspirational. There is art that I’ve created that has given me hours of happiness and joy and sometimes the giggles. 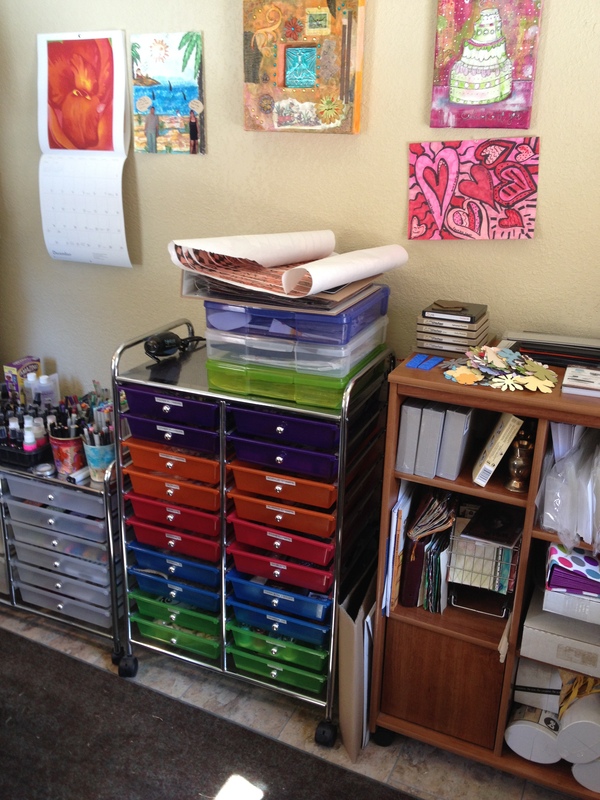 The shelves and drawers and stacks and tubs of art supplies give me the feelings of possibility, curiosity and discovery. Art = Happiness. Art Out With Your Heart Out. This is my own little slice of heaven. It is an 8′ x 12′ slice of heaven but my slice nonetheless. I have two windows and a nice high ceiling and it is well-insulated and heated and air-conditioned. It meets my needs perfectly! 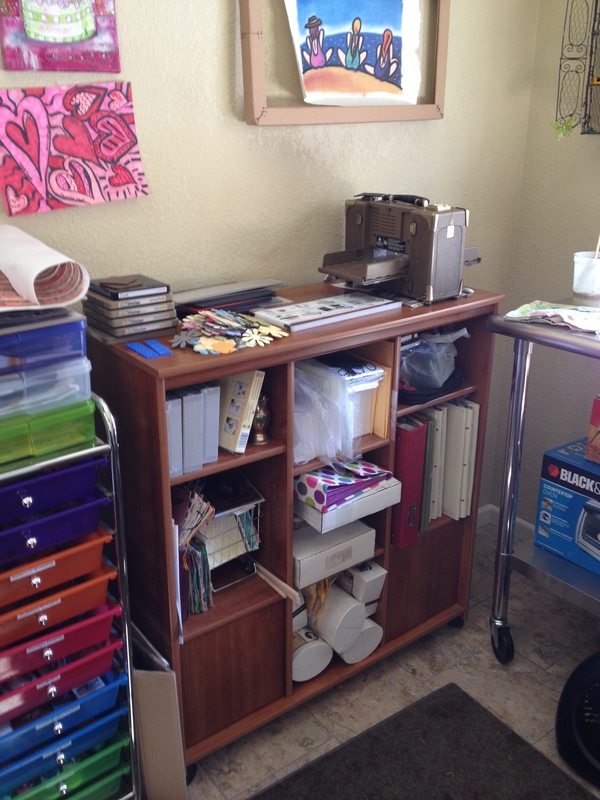 Inside it is fun and functional and there are lots and lots of art supplies. Would you like to have a peek?